Unlike iPad 1 & iPad 2, the 3rd generation iPad will not have Indian consumers waiting for too long (atleast officially). According to a press release put out by Apple, the new 3rd generation iPad will arrive in India on April 27th apart from 8 other countries (Colombia, Estonia, Israel, Latvia, Lithuania, Montenegro, South Africa and Thailand). A week prior to that (April 20th) it will make debut in 12 more countries (South Korea, Brunei, Croatia, Cyprus, Dominican Republic, El Salvador, Guatemala, Malaysia, Panama, St Maarten, Uruguay and Venezuela). iPad will be available in black & white colors and will have starting price of Rs. 30,500/- for 16 GB wifi only model, while the 4G version will cost Rs 38,900/-. The top end 64 GB model with wi-fi and 4G will cost a cool Rs. 50,900/-. One caveat, if you think that 4G version of iPad will be able take advantage of Indian 4G network, it is not so. The 4G spectrum which iPad supports is available only in US, Canada and handful of other countries. However, 3G should work without any issues. 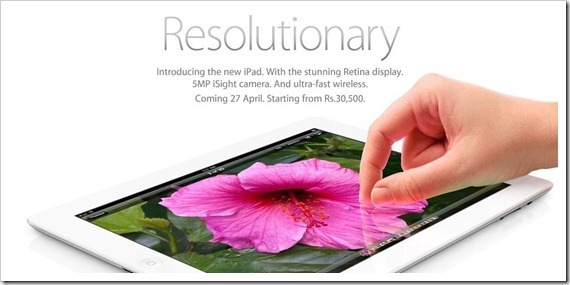 With launch of iPad 3, the iPad 2 prices have been slashed – The 16 GB iPad 2 wi-fi model will be now available for 24,500, while the 3G version will cost 32,900 rupees. i bought 64gb 4g due to curiosity. it is not really worth. Blackberry playbook the ultimate. you can brows using blackberry phone via Bluetooth. operating system is mind blowing. Ipad3 just waste of money. you need to buy all worthy applications. or what ever you download for free is entry level, for next level apps u need to pay a lot. I dont suggest… IPAD3. retina display does not make any sense. the ipad 3 is a very lovely gadget. It has lot of applications in it.It is very good. ipad 3 with 32 GB Wifi Plus 4G Configuration what will be the cost in India. very very good I pad 3 but I have already going to have it on 17 may 2012at 12.00 pm.